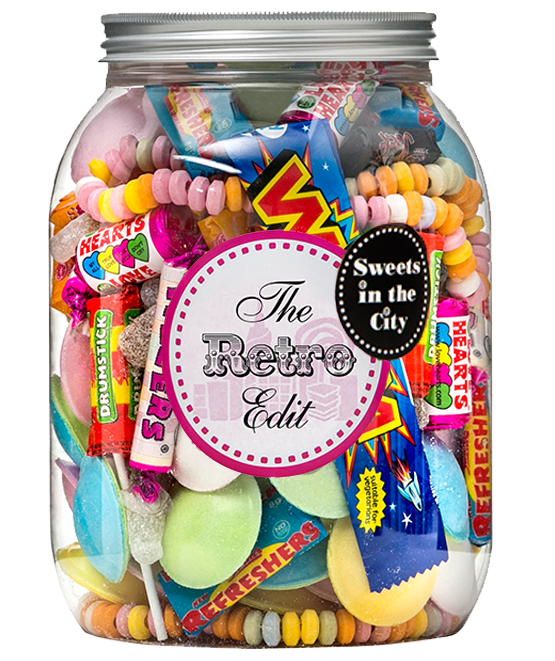 Bring out their inner child with this big jar of retro sweets! 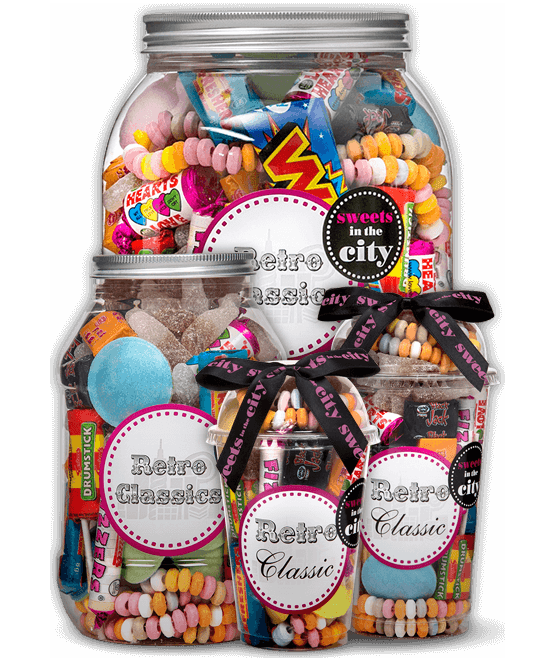 Our retro sweets gift jar is jam-packed with all those yummy treats you remember from your childhood. There is a bite of nostalgia here for everyone…but have you grown up enough to share? 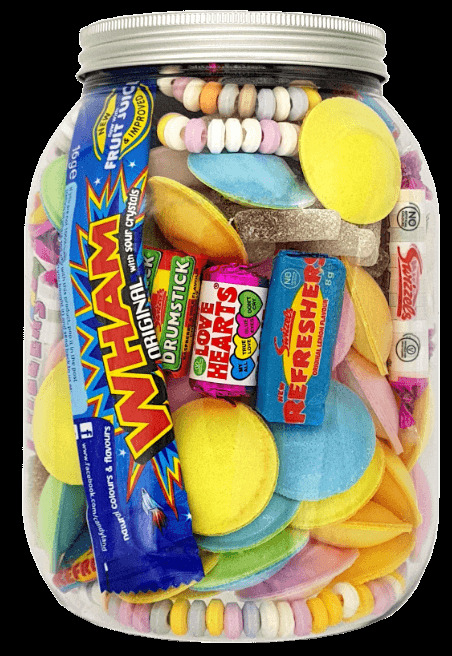 Packed with old-school playground picks, we think the only thing better than treating somebody to our retro sweet selection is keeping them all to yourself. We won’t tell! 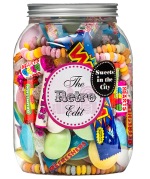 Product 1: Glucose syrup, sugar, palm oil, natural colours (vegetable carbon, paprika extract, anthocyanins), acid (citric acid), beef gelatine, aniseed oil, emulsifier (SOYA lecithins), flavourings. May contain traces of MILK. Product 2: Glucose syrup, sugar, palm oil, citric acid, beef gelatine, flavourings, natural colours (paprika extract, anthocyanins) emulsifier (SOYA lecithins) May contain traces of MILK. 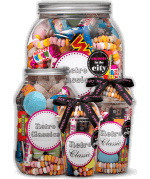 Product 3: Sugar, dextrose, maize starch, acid: tartaric acid; acidity regulator; sodium hydrogen carbonate; flavourings, colours: E100, E132, E162. Product 4: Glucose syrup, sugar, vegetable oils (palm, palm kernel), acidity regulator: citric acid; gelling agent: gelatine; emulsifier: glycerol mono stearate; flavourings, colour: anthocyanin. Product 5: Sugar, glucose syrup, WHEAT starch, modified maize starch, acids: E260, E270, E296; modified potato starch, BARLEY malt extract, flavouring. Product 6: Glucose syrup, sugar, vegetable oils, (palm, palm kernel), acidity regulator: citric acid; gelling agent: gelatine; stearic acid, modified starch, emulsifier: glycerol mono stearate; flavourings, anti-caking agent: magnesium carbonate; magnesium stearate, colour: lutein. 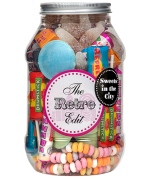 Product 7: Dextrose, glucose syrup, anti-caking agents (magnesium salts of fatty acids, mono-and diglycerides of fatty acids), acid (citric acid), maltodextrin, flavourings, vegetable oil (coconut), colours (paprika extract, anthocyanins, beetroot red, beta-carotene). 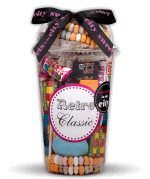 Product 8: Sugar, acidity regulator: malic acid; stearic acid, sodium bicarbonate, modified starch, magnesium stearate, anti-caking agent: magnesium carbonate; flavourings, colours: anthocyanin, copper chlorophyllin, curcumin, lutein, paprika. 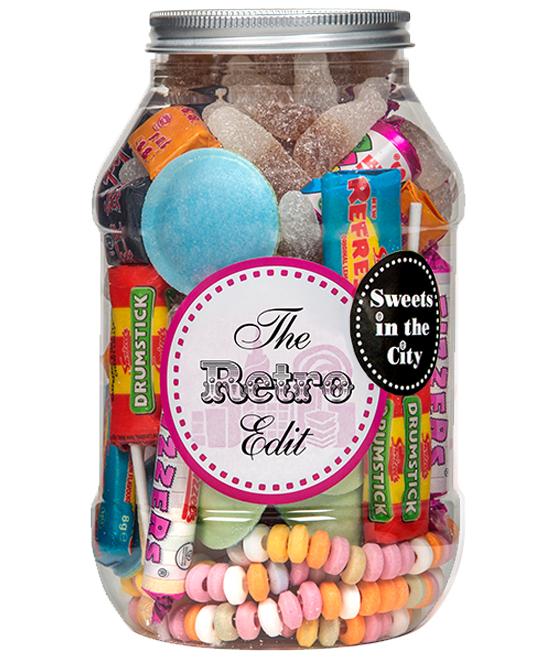 Product 9: Sugar, acidity regulator: malic acid; stearic acid, sodium bicarbonate, modified starch, magnesium stearate, anti-caking agent: magnesium carbonate, flavourings, colours: anthocyanin, beetroot red, copper chlorophyllin, curcumin, lutein, paprika. Ingredients on wrapper: (Wham Bar). Please note: As all our gifts are hand packed, there may occasionally be small variations in product fill and design. 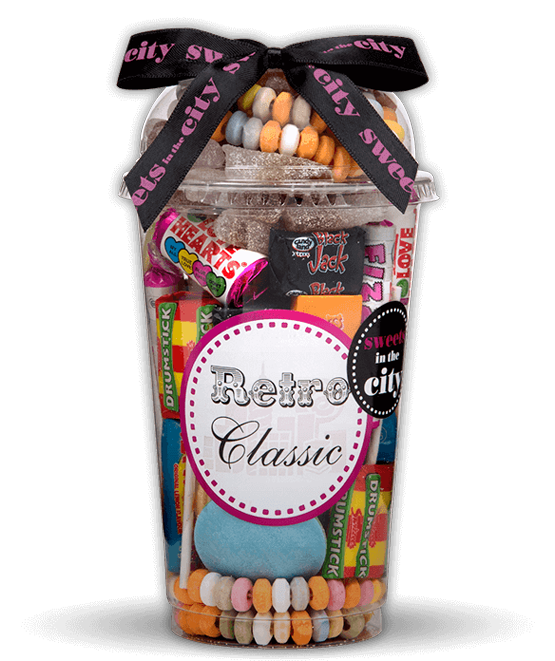 We think that's what makes a Sweets in the City gift unique! Really simple from order to delivery, loved that you can personalise the item for free! Received well packaged and undamaged. Item was also full to the brim.